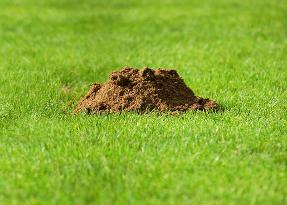 Mole catchers in shrewsbury aren't all the same. 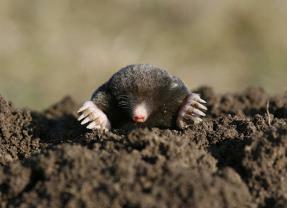 Mole problem? No problem! We offer effective control & trapping solutions in the Shrewsbury area and Shropshire. Whether it be damage to your beautiful garden lawn, vegetables in your allotment, business, farm or paddock, we can offer a quick & effective service at a time to suit you, contact us 7 days a week. Our effective removal methods are done using traditional trapping techniques , no chemicals or poisons are used. From only one mole in a small garden to infestations on large country estates & farms, we provide a discreet & professional clearance service to fit your needs & budget. Don't be fooled by the innocent look of these pests, they are quick & very destructive, within a week one hill can quickly escalate to extensive tunneling, damaging the structure of your lawn or property causing unsightly hills, uneven surfaces, damaging roots and vegetation. On farmland the problems caused by moles can include soil contamination of silage - which can increase the risk of disease in livestock and damage to mower blades . 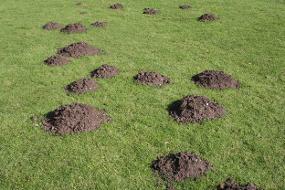 As well as the significant loss of grazing that a mole infestation can cause-each molehill can cover a square foot of grazing. Wether you have just a few hills in your garden or hundreds in your fields contact us to bring your pest problem to an end. Minimise the damage & start a control programme today. Our low cost catching & trapping service is chemical free, quick & cost effective. Based in Shrewsbury North Shropshire, areas covered include Shrewsbury, Oswestry, Wem, Ellesmere, Baschurch, Bomere Heath, Wellington, Telford, Roden , Edgmond , Newport ,North Shropshire. As well as the Shropshire and Powys Borders. Contact Us Now - No Trap No Fee !